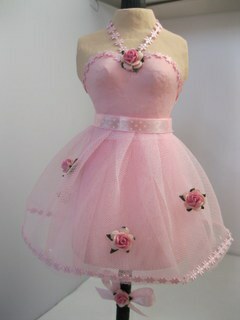 Create a gorgeous Dress Form Skirt and make your mannequin look really feminine. It's the attention to detail that will make this something special and something that you will be proud to give as a gift to any of your girly friends. Or maybe you just want one to keep for yourself. 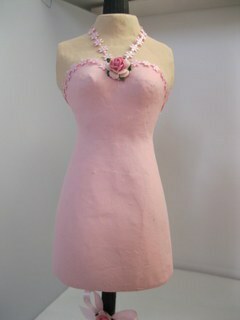 In the video Painting your Dress Form this was the mannequin that was created. Along the edge of the dress I have added in a tiny flower trim to create the halter neck style. Then I added a rosebud to the centre to hide the join. But because I wanted to add in the skirt I did nothing more to it. So here is the tutorial that will show you how to create the skirt and you don't need any sewing skills at all. The flowers are from Wild Orchid Crafts and I have glued them in place on the net skirt. The trim around the skirt is the same as the one around the neckline and just ties everything in together. That one had a domed crown and we used a Polystyrene ball to make the dome. 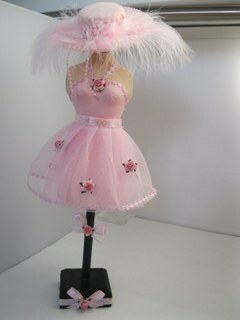 But I have added another short video to give you an alternative style of hat that is very easy to do. The stand that has been used for this particular dress form has been made by my "Film Crew"
It is more sturdy and decorative to the original one. But I have used the same ribbon and flowers to decorate it and that will also tie everything in together.